The 42 meter long fish carrier Ringaskjær ran aground near Hekkingen, Norway. 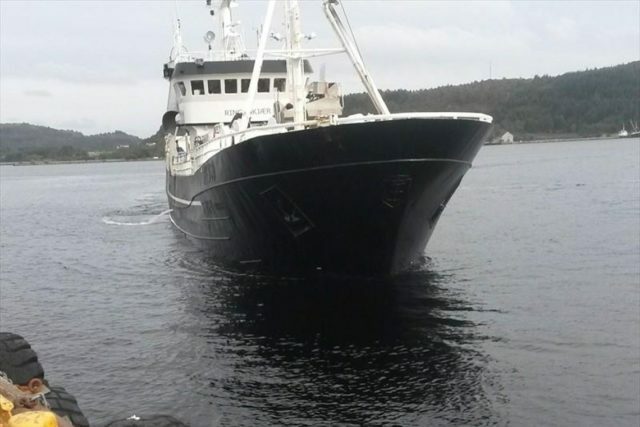 The Ringaskjær had some 300 tons of herring on board when it struck a rock and sustained hull damage. The fish carrier suffered water ingress. The crew alerted authorities who dispatched vessels and a helicopter to the scene. The NSSR lifeboat arrived a short time later and found the Ringaskjær had sustained a large amount of flooding. The NSSR lifeboat deployed out several dewatering pumps to bring the flooding under control. Authorities removed part of the cargo of herring from the holds. After the water ingress was controlled and the fish carrier was no longer in danger of sinking, the Ringaskjær was taken under tow to Eidkjosen by the NSSR lifeboat. No reports of injuries.